With their sleek designs and adaptability to new environments, contemporary office cubicles might be just the thing you’re looking for as your business is going through major changes. Whether you’re a startup or have a well-established presence, your office furniture of choice doesn’t have to be the traditionally static desks and chairs of long ago. In fact, this is the perfect time to invest in new and exciting workstations for your employees. Just as you move forward with your company, you should want to select modular office furniture that can move right along with you. Expanding your business is a dynamic process that winds its way through multiple aspects of how your business operates—such as how management interfaces as well as how individual teams might coordinate, internally and with each other. Due to their high level of customization and configurability, contemporary office cubicles are a perfect fit in your plans for expansion, but first, it’s important to determine just how they’ll fit in a physical sense. When moving into any new space, you have to consider how your furniture and other large equipment will be accommodated. As your office expands, looking at historical and projected growth trends, as well as understanding how your space will be used by your new personnel can help to clarify how your contemporary office cubicles can optimize workflow and the daily operations of your business. Keep in mind that when it comes to this office space planning, you can always rely on Cubicle World. Our founder and company president Jerry Mogyorody has an expansive professional history with many years of space planning under his belt. He’s successfully resolved office space issues using various layouts, including traditional, open-concept, closed-concept, and blended schemes, and he can no doubt supply the contemporary office cubicles your office needs to support the demands of your growing business, all while adding flexibility and a modern aesthetic. Contemporary office cubicles don’t have to conform to conventional standards of cubicle workstations. In fact, as today’s creative fields grow, more employees—such as those in the fields of arts and design, marketing, and IT and software—find the traditional cubicle more boring than ever and in no way reflective of their boundless creativity. With contemporary office cubicles, you can break away from the idea of the confining, boring workstation that puts everyone safely in their own cube-shaped world. Workstations can be imbued with a sense of fun through curved worksurfaces and walls. They can physically expand as an option that blends privacy and openness through the use of different-height partitions and dividers. This can allow for clusters of people to regularly collaborate in a project setting while also addressing a need for personal boundaries and privacy. They may even free the office worker from a solely sedentary mode of work and promote health and activity in the form of adjustable standing desks divided by moveable standing partitions. There’s also no reason why you can’t make use of the many available materials and colors that can add a touch of excitement to your contemporary office cubicles. Adding a hint of bold color can awaken the senses and introduce a touch of excitement to the office environment. If your contemporary office cubicles are in view of visitors, why not use them to convey a sense of branding of your own business? Ergonomics should always be part of the equation when looking to provide the right office furniture for a growing team of happy and healthy people. Contemporary office cubicles are pro in their ability to address the physical needs of their users because of their adaptability in design along with the number of responsive features that aren’t available with more traditional workstations. Comfortable work surface height, reachable storage features, LED task lighting to supplement ambient natural or mechanical daylighting—all these are features that allow employees to stay comfortable as they get through their day’s work, especially when paired with our ergonomically-designed office chairs. With the expansive supply chain at our fingertips, Cubicle World is expert at meeting your budget limits by delivering exactly what contemporary office cubicles you’ll need for your growing business. We can offer our superior ability to customize your work areas, private and collaborative, in order to meet your needs as your company adapts and grows. 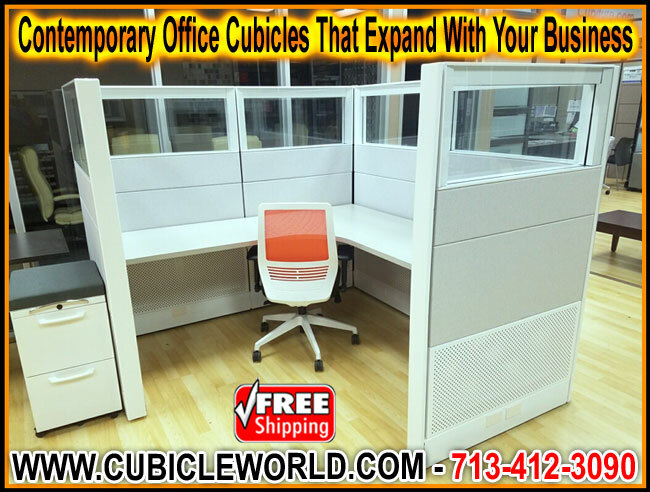 Don’t hesitate to call us at Cubicle World today!